Supplying medical-grade cannabis since 2002 under Canada’s, Marijuana Medical Access Regulation Program; Bud Buddies has put itself on the map as a reliable online dispensary service. Moreover, not only does this company have decades of wisdom, knowledge and experience, they have also earned dozens of awards internationally. As a collective, the growers at Bud Buddies consistently produce some of the highest quality cannabis strains on the market, worldwide. We think most customers are looking for top notch and potent cannabis, without having to feel stuck with overpriced and underwhelming products. This is why we search tirelessly for the best online dispensaries Canada has to offer. We were excited to try out Bud Buddies, knowing the esteem they have collected over the years was hard earned through exceptional customer service, coupled with extraordinary care and the quality that can only be excelled through years of experience and determination. While the fast, professional and incredibly friendly service certainly made an excellent first impression, we were most eager to try the products themselves. The BC Bud Guarantee confirms that every strain was developed, grown and processed locally, right in British Columbia. Furthermore, this pioneer in the industry has both a ‘Reefer-a Friend’ and a Bud Buddy customer rewards program that rewards their loyal clientele. They also had a quick and responsive website that was easy to order from. Bud Buddies also have free shipping on all orders over $200. The anticipated first from Bud Buddies was Cookies and Cream; delivered with the rest of the products that I was going to review, but separated and labelled appropriately. I was pleased with the discrete packaging, but even more pleased with the sight of this strain. A balanced hybrid between one of the many Girl Scout Cookies phenotypes and the infamous Starfighter, the nugs were mostly green with an icy layer of frosty trichomes slathered thickly across the top. Scattered throughout were yellow pistils that peeked through the bud; a trademark from its Starfighter lineage. When smoked, the “Cookies and Cream” name did not disappoint. I was promised a dessert-like flavour profile and I was delivered a faintly sweet, vaguely vanilla smoke, that was truly a treat. The creamy mouthfeel on the inhale did not go unnoticed; smooth on inhale, while it also had a deliciously silky and rich feel on exhale. Additionally, the aftertaste had a lingering skunkiness with a roasted, almost nutty flavour. On the other hand, the aroma of the smoke was anything but sweet; the lingering skunk flavour came roaring once again to the forefront with a powerful skunk-like scent, that filled the room with its noxious potpourri. When vaped, the room was filled more pleasantly with hints of vanilla and a fresh, herbaceous aroma. Each hit was invitingly smooth, with a mouthfeel so exquisite, I probably took a few too many hits. Vaping offered a more pronounced dessert-like flavour that I am still craving more of. The effects of Cookies and Cream were sativa-like in nature, providing intensified sensory perception and a cerebral mindfulness that elevated my focus and mood. I could tell it was a hybrid, though; my head and body both felt weightless at one point, a step further from the average “couch-locked” high. A reliable strain whether you use cannabis medically or recreationally, Cookies and Cream could help with a variety of symptoms and conditions, including (but not limited to): inflammatory conditions, chronic pain, fatigue, fibromyalgia, appetite loss, glaucoma, migraines, stress, multiple sclerosis, opiate addiction and recovery, Parkinson’s disease, nausea, depression, anxiety and/or other mood disorders (as directed). Death Bubba from Bud Buddies was a sight for sore eyes when my eyes first locked with the perfectly trimmed nuggets. The beautiful flowers had a multi-faceted, complex blend of sage, hunter and emerald greens, with dark and royal purples interwoven throughout. Orange pistils also sprouted madly throughout all the green and purple; perfectly frozen in chaos. Additionally, the crystal trichomes were voluminous and caked on the nugs, leaving plenty of kief to be sprinkled on my lovely joint. When combusted, the fragrance was a pungent mix of skunk and grass; though the smoke itself was clean, sweet and earthy on the palate. Filling my lungs easily, the hits were smooth and mellow. A hybrid of Death Star and Bubba Kush, I could taste strong, indica kush lineage. When vaporized, the sweet flavours that had only lightly danced on my palate when smoking, were far more prominent. The pungent and earthy flavours and aromas took more of a backseat, to the sweet fragrance that filled the room. A pleasant experience, I did not find myself hitting it too hard with the vape (as I so often do with new strains); the hits were relaxing, always smooth and never harsh. As soon as I indulged a bit, I was put into the ultimate relaxed state of mind. With an extraordinarily high THC level between 25% and 27%, I was instantly put in a better mood. A heavy, indica dominant hybrid, I definitely tried this one too early in the day and ended up couch-locked and snoozing. However, this could work well as a powerful sleep aid, as many indicas reliably do. In fact, Death Bubba can also be used to help treat a number of symptoms and conditions, such as (but not limited to): insomnia, moderate pain, fibromyalgia, stress, inflammatory diseases, Parkinson’s disease, opiate addiction and recovery, nausea, glaucoma, depression, anxiety and/or other mood disorders (as directed). With Red Congolese having an almost 100% sativa profile, it is odd that it has a more of an indica-like appearance, but this can be explained by distant Afghani and Mexican Sativa roots. The well trimmed and perfectly cured buds sang to me, as i glazed across the delicate surface of the buds. Across pale green buds, coated in a heavy trichome layer, were vibrant orange pistils that sprout up like tiny, individual hairs. Each bud was completely littered with robust pistils, so dark they almost appeared blood red in certain lighting. When smoked, Red Congolese from Bud Buddies had a beautifully complex flavour and aroma profile. A taste of peppery spice was evident; as well as, a sweet and creamy fruitiness, topped off by a rich and cheesy earthiness, that rounded out this delicious strain. The room was filled with a nutty and earthy fragrance, that mixed with the fruity and cheesy aroma; making for a complicated fragrance, that was intriguing to the senses. When vaped, the spicy and sweet aftertaste of herbs and a tangy citrus flavour became evident; interwoven neatly within the flavour profile. Overall, it had a similar fragrance to combustion, although the fruity aroma became far more prevalent to my senses. 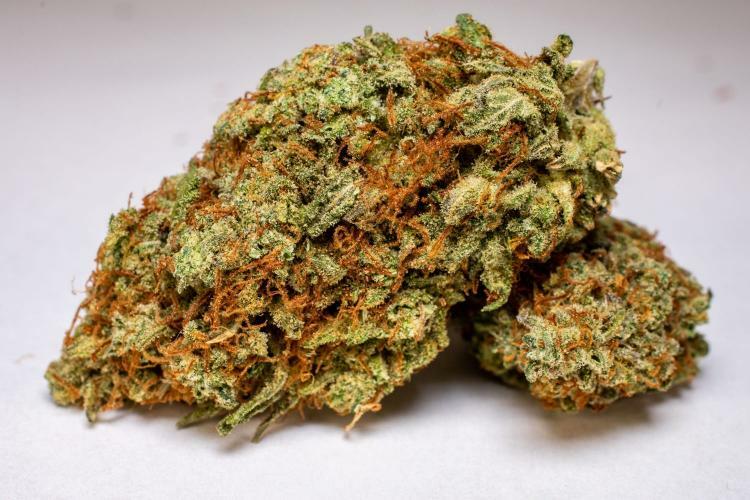 Although Red Congolese is mostly indica in appearance, the sativa-like properties of this strain became evident through its delightful effects. The peak of the high was an elated feeling of awareness and enhanced perception and an increased ability to focus; that I took advantage of, to get some tasks done. This strain was also accompanied by an excitable energy and a light, tingly body high, that faded into an enhanced feeling of tranquillity. While Death Bubba was perfect for sleep, Red Congolese was the perfect daytime strain; ideal for an exquisite wake and bake session, to start off your day, the right way. This daytime strain could also help in treating a variety of symptoms and conditions, including (but not limited to): stimulating appetite, Parkinson’s disease, ADHD or trouble focusing, chronic stress, opiate addiction and recovery, nausea, chronic pain, glaucoma, fibromyalgia, multiple sclerosis, inflammatory disorders, seizures, depression, anxiety and/or other mood disorders (as directed). Essentially a portable vape pen with honey oil, the Herbosi Honey Oil Vape Pen was filled with a deep, translucent and vibrant, golden-amber oil that was labelled “Grapefruit”, although it did not have a strong citrus taste. Instead, the cartridge had more of a sweet taste, with heavy earthy and nutty undertones. The vape pen was also a device that delivered very smooth, powerful hits; that left a delicious dry and nutty aftertaste, that caused a bit of a thirst. This pen was intensely satisfying and lasted quite a bit longer than most honey oil cartridges I’ve tried, speaking to both the potency and the large capacity of the cartridge. The effects from Herbosi’s vape pen were mind-numbing and potent; especially for me, a seasoned veteran! Bud Buddies Red Congolese was a very refined experience, delivered by a quality product. Herbosi had several flavours to choose from, so I look forward to trying more cannabis honey oil vape cartridges in the future, as this was by far, hands down, the best honey oil pen I have had the pleasure of sampling (and I’ve tried several!). The Grapefruit cannabis honey oil vape cartridge from Herbosi can also help to treat a variety of symptoms or conditions, such as (but not limited to): insomnia, appetite loss, fatigue, opiate addiction and recovery, inflammatory diseases, Parkinson’s, fibromyalgia nausea, PTSD, chronic stress, chronic pain, glaucoma, depression, anxiety and/or other mood disorders (as directed). A rare, hybrid with an unknown sativa:indica ratio, Blue Coma hails from the Fraser Valley in British Columbia, Canada. The genetics for this strain are another unknown, which just adds to the mystery and magic of the shatter. Exquisite and translucent amber hues, with a pull-and-snap, glass-like texture were presented in a thin, airtight envelope, with brown wax paper protecting the precious contents within. An inviting sight, I was excited to try this rare and exquisite treat. When vaped in my dab rig, it delivered an intense hit that I wasn’t quite prepared for. I’m glad I tried this shatter after the flower strains, as this shatter had a unique flavour and a hit that punched me in the face with its robust and potent vapour cloud. I may have just loaded too big of a dab, to be fair, but I was able to notice the pungent aroma; as well as, the subtle fruitiness of the underlying flavour. Moreover, the fruity fragrance and flavour become more prominent the more I vaped; even though I took much smaller dabs subsequently. Pungent, with a slightly skunky aroma; but, not overwhelmingly so, Blue Coma Shatter was the perfect concentrate to try after a long, hard day. Blue Coma Shatter from Bud Buddies was a potent hybrid concentrate that delivered euphoric and strong, uplifting effects. As the name might suggest, it could definitely put someone in a “coma” of a couch-locked sensation if consumed in excess. This concentrate can be used by experienced and novice users alike; however, we recommend using this shatter as an evening strain in a safe environment, if you are inexperienced with this potent concentrate. This beautiful and relaxing shatter would be ideal in helping to treat a number of symptoms and conditions, including (but not limited to): headaches, chronic pain, fibromyalgia, insomnia, appetite loss, opiate addiction and recovery, nausea, glaucoma, stress, inflammatory diseases, depression, anxiety and/or other mood disorders (as directed). Last, but certainly not least, I tried Bud Buddies’ Raspberry ZZZ Jelly Bombs from Twisted Extracts. Each blue raspberry and Lego-like gummy candy was infused with 80mg THC. The entire piece however, is not meant to be eaten in one sitting. The candy can be divided into 8 even pieces, allowing the user to start low and slow, with small and individual, 10mg doses. Furthermore, Twisted Extracts recommended that I take a single, 10mg dose, since I was a first-time user of the product. I was to then allow at least 90 minutes to pass, before deciding if I needed another one. While I did only eat a 10mg dose at first, I will say I only waited about 60 minutes before digging into a second dose. In hindsight, I should have waited the full 90 minutes. The effects hit me about 20 minutes later; however, they were amplified thanks to the second dose. It hit me hard and fast and time seemed to slow down. It felt as if I had sat on the couch for hours, but I wasn’t really sure if I really had, or if it had all been in my mind. I also became highly introspective. The candy did not make me “too” high or dizzy; instead, I had a very intense body and cerebral high, that made me want to relax into the coziest section of my bedroom. I became increasingly thankful that I decided to try this edible later in the evening, as I fell asleep about 45 minutes after the peak of the high had hit me (which took approximately 2 1/2 hours to peak). An enjoyable experience, I would still recommend this as a perfect night time edible, ideal as a sleep aid (but maybe just one dose, depending on experience). This delicious and childhood-reminiscent gummy candy edible can also be used to aid in treatment of a number of symptoms and conditions, such as (but not limited to): insomnia, pain, stress, inflammatory diseases, lupus symptoms, multiple sclerosis, opiate addiction and recovery, depression, anxiety and/or other mood disorders (as directed). 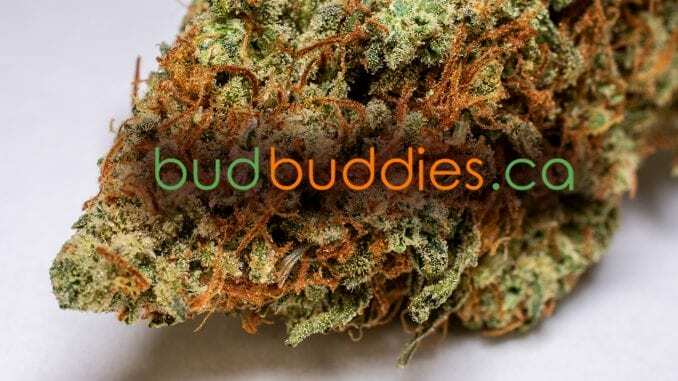 Reliable, Award Winning, with Impeccable Quality: Bud Buddies Delivers, Guaranteed! Bud Buddies is a pioneer in the cannabis industry and provides a user friendly, easy to use, online website. Their brand presence and years of experience with a craft cannabis cooperative has lead to a superior product that is grown, sourced and processed in beautiful British Columbia. Moreover, Bud Buddies offers loyalty points and referral rewards, for every friend you sign up. This is an online weed dispensary service that consistently delivers top quality strains, concentrates and marijuana edibles. From start to finish, this mail order marijuana (MOM) dispensary led me through the process, answering any and all questions, courteously and promptly. With one of the most dependable names in the industry, free shipping over $200 and a one use, 25% off coupon code: GTA; all I’m wondering is, have you tried Bud Buddies yet? Have any questions or comments about Bud Buddies? What’s your favourite strain? Please leave a detailed response below!